NASA's budget for the next fiscal year is likely to include deep cuts to planetary science programs, forcing the space agency to withdraw altogether from an international effort to send two new missions to Mars, experts say. President Barack Obama is slated to submit his administration's federal budget request for fiscal year 2013 on Monday (Feb. 13), and NASA will hold a series of briefings to discuss its share on the same day. While exactly how much money is allocated to NASA is unknown, insiders expect a significant reduction in the portion slotted for robotic exploration of Mars and other solar system bodies. The cuts probably will compel NASA to bow out of the European Space Agency-led ExoMars missions, which aim to launch an orbiter and a drill-toting rover to the Red Planet in 2016 and 2018, respectively, says one space policy expert. A mock-up of the European Space Agency's planned ExoMars rover. Logsdon said he expects NASA's overall budget for fiscal 2013 — which runs from Oct. 1, 2012, to Sept. 30, 2013 — will be roughly similar to the agency's funding for the current year. NASA received $17.8 billion in the current fiscal year, or about 0.5 percent of the federal budget. However, the scuttlebutt in the space science community suggests NASA's planetary science program will suffer serious cuts, Logsdon added. The journal Science's ScienceInsider publication reported Thursday (Feb. 9) that Obama's budget request will allocate $1.2 billion to the program, compared with the $1.5 billion that planetary science received in fiscal year 2012. The 20 percent cut would make it tougher for the space agency to tackle ambitious exploration projects, including ExoMars. This state of affairs helped persuade Ed Weiler to tender his resignation as chief of NASA's science mission directorate last September, ScienceInsider reported. "The Mars program is one of the crown jewels of NASA," Weiler told ScienceInsider. "In what irrational Homer Simpson world would we single it out for disproportionate cuts?" Logsdon and other experts say planetary science is probably being slashed in part to help pay for the James Webb Space Telescope. That muscular successor to NASA's Hubble Space Telescope has suffered repeated delays and cost overruns over the years. The huge instrument is now slated to cost $8.8 billion and launch in 2018 at the earliest. 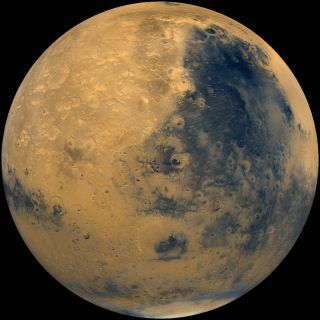 "Finishing Webb is being given a higher priority than starting or committing to new Mars missions," Logsdon told SPACE.com. As it currently stands, ExoMars would launch the methane-sniffing Trace Gas Orbiter toward the Red Planet in 2016 and a robotic rover two years later. NASA is slated to provide the rockets for both ExoMars launches, as well as a variety of instrumentation for the orbiter and the rover. The U.S. space agency also is supposed to contribute the landing system for the rover's descent to the Martian surface. But NASA probably will have to pull out of the ExoMars effort now. "Frankly, I think there's no doubt about that," Logsdon said. In fact, ESA has already begun talking to Russia about picking up the slack, according to media reports. Russia's Proton rocket could send the ExoMars orbiter and rover on their way toward the Red Planet, experts say. Artist's concept of the ExoMars 2016 spacecraft, which consists of the Trace Gas Orbiter and the Entry, descent and landing Demonstrator Module (EDM). Not all NASA programs will suffer as badly as planetary science in next year's budget. For example, commercial crew development — NASA's effort to encourage private spaceflight companies to start ferrying astronauts to low-Earth orbit and back — appears poised for a bump. This week, NASA announced that it is planning to award up to $500 million to each of two spaceflight companies over the next two years to help them complete their vehicle designs. "Since they only have $400 million this year, that means they have to be counting on a pretty substantial allocation for next year," Logsdon said. Such budget increases, however, are likely be few and far between. As the federal government tries to cut costs across the board during these tough economic times, it's easy to imagine many NASA employees trying to ward off disappointment by lowering their expectations. "If they maintain parity — if they're just not cut too much — that may be enough in the current environment for most organizations," Roger Launius, space history curator at the Smithsonian Institution's National Air and Space Museum, told SPACE.com. "And I suspect that there are many people at NASA that will count it a victory if the overall NASA budget for FY 2013 is comparable to the budget this year and last year."